The respected US journal Science, which printed two now-discredited papers by disgraced South Korean scientist Hwang Woo-suk, has retracted both articles. An investigation panel concluded on Tuesday that evidence supporting both papers had been faked. The journal therefore decided that an "immediate and unconditional retraction of both papers" was needed, it said. 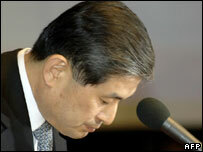 Dr Hwang made a public apology for the fabrications on Thursday, asking South Koreans for their forgiveness. He said he would take responsibility for the errors, but claimed he had been deceived by junior researchers. The case of Dr Hwang - once seen as a celebrated cloning pioneer and a national hero in South Korea - is now being investigated by prosecutors. More scientists in his research team were prevented from leaving the country on Friday, local media reported. A total of 28 team members have now been ordered to stay in South Korea pending further investigations, according to Yonhap news agency. A final report from experts at Seoul National University, published on Tuesday, said that Dr Hwang had faked his most famous work, the production of a stem cell line taken from a cloned human embryo. 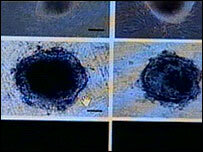 The panel had previously rejected another of his landmark claims - to have produced individually tailored stem cells. Both papers were published by Science - one of the world's most prestigious academic journals. "Because the final report of the SNU (Seoul National University) investigation indicated that a significant amount of the data presented in both papers is fabricated, the editors of Science feel that an immediate and unconditional retraction of both papers is needed," the journal said in its statement. "We therefore retract these two papers and advise the scientific community that the results reported in them are deemed to be invalid." Dr Hwang faced the media for the first time on Thursday, two days after his claimed breakthroughs in stem cell research were exposed as a fake. "The use of fake data... is what I have to take full responsibility for as first author. I acknowledge all of that and apologise once again," he said. But he insisted that most of the fabrications were carried out without his knowledge, by collaborators on the project. Charges against Dr Hwang and his team could include fraud and embezzlement.